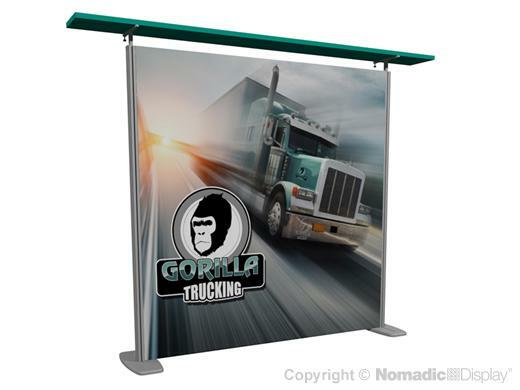 Inspire 2.0 more traffic at your next event with a tension fabric display that delivers an upscale aesthetic and exceptional value. Inspire 2.0’s exclusive canopy design converts into striking shapes using the same canopy cover. It’s like getting four display designs for the price of one! Interchangeable accessories easily mount directly to sturdy aluminum extrusions. Rearrange options to meet your functional demands. Choose from options such as iPad stands, product pedestals, shelves, brochure holders and more! A 10’ Inspire 2.0 display – canopy with cover, seamless SEG printed fabric panel, set of lights and set of fins – packs in just one wheeled case weighing less than 120 lbs that ships UPS. Additional accessories pack in a second case. Inspire 2.0 is a budget stretching solution because it’s scalable to expand or contract to work in multiple exhibit spaces. This 10’ Inspire 2.0 tension fabric display connects to another to form a high impact 20’ inline.